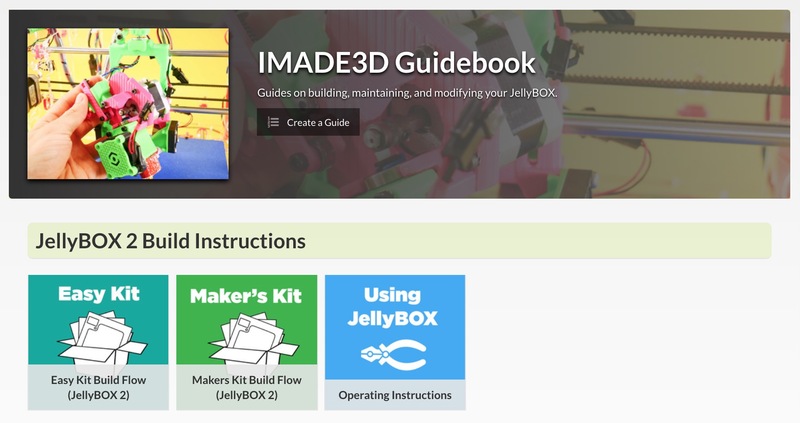 IMADE3D | JellyBOX Support, Instructions, Guides, Resources, 3D Prints, and more! Also located at the top of this page, just in case you missed it. Your JellyBOX came with an SD Card pre-loaded with scripts, 3D models, ready to print 3D files (gcodes), and more. First ,try to print the ready to print files (GCODEs) on your SD card. You want to start slicing and printing your 3D models of Your choosing as fast as you can. Herein lies the magic. A good aggregation of places from which to download tons of 3D models and more from our friends at Astroprint. A neat curated recommendation service. Common folk and IMADE3D staff roam the forum hand in hand. Come and join! We are friendly and eager to help you out. Download the latest firmware upgrade file. Then, follow our Firmware Upgrade Guide. If you know what’t you want, if you’re a power-user, if you know what Git is, then at our GitHub you can find all the latest downloads. If you don’t know what this means, no worries! With your JellyBOX, you got an SD Card pre-loaded with scripts, 3D models, ready to print 3D files (gcodes), and more. The contents of the SD card grow and evolve over time. If you ever loose your card or want to get the latest and greatest contents, you can always download it here. Print yourself a spare part when you break something. Use pre-sliced gcodes (for PETG!) ready to be printed on your JellyBOX to match the production parts. If you prefer to slice the files yourself, there are STLs as well. Finally, to lasercut yourself some JellyBOX pieces, there’s rld files ready to cut (exportable into dxf, ai, and more for editing). IMADE3D Community Forum is the first support authority. Come and join. We are eager to help you out. We truly want everyone to successfully build their own JellyBOX. In a move that some may call insane, we decided to offer something truly unseen: we decided to guarantee your success. As long as you register (free, within 60 days), not only we will cover defects caused by transportation or manufacturing, but we will also provide you with free replacement parts even if you break something and it’s your fault. Anything you may need to actually get your JellyBOX up and running. There are really no downsides to the Success Guaranteed Warranty, so go ahead and register your build right now. Registration for “Success Guaranteed” Warranty is free. You have to register within 60 days upon receiving your JellyBOX kit. If you register for the Success Guaranteed Warranty, you are still covered by the Standard Warranty as well. Under the “Success Guaranteed” Warranty, we will provide any replacement parts you may need to successfully build your JellyBOX for free. This includes things broken by an accident, things broken during shipping, or manufacturing defects. Shipping costs are covered by the customer, unless the support falls under the Standard Warranty conditions (see below). This warranty covers the first build up to 6 months upon delivery. The JellyBox has been assembled according to the official step by step documentation available at the time of the purchase through IMADE3D website. The JellyBOX kit was sold and delivered by IMADE3D or an authorized IMADE3D reseller. The JellyBOX kit was not sold as used, refurbished or factory seconds. All parts used on the machine are purchased from or approved by IMADE3D. Even if you don’t register for our free “Success Guaranteed” Warranty, you are still covered by our Standard Warranty. Within 60 days after delivery of your JellyBOX, if you discover a manufacturing defect or if something arrived damaged from the shipping, contact us and we will get you free replacement parts. We will pay for the shipping, too. Note that we are not responsible for replacing parts that may break during assembly, unless you register for the “Success Guaranteed” Warranty. 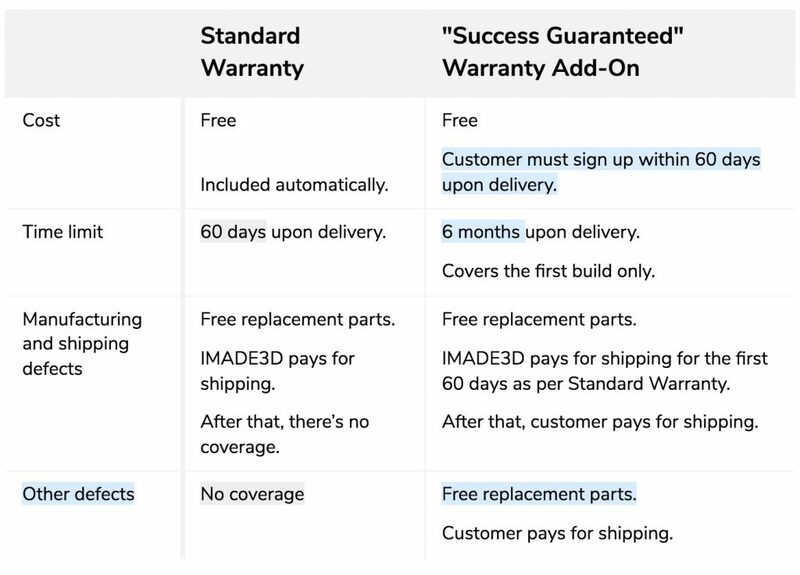 Standard warranty covers all mechanical and electrical components and/or whole JellyBOX kits purchased from and delivered by IMADE3D or an authorized IMADE3D reseller. Standard Warranty is in effect for the first 60 days after delivery. Standard Warranty is not in effect if the JellyBOX kit was sold as used, refurbished or factory seconds. As you can see, “Success Guaranteed” is a free add-on to the Standard Warranty and it has no downsides. You should probably sign up for “Success Guaranteed” right about now.